The most imperative of cutting copper is to realize what you are managing. You will need different tools to cut different types of copper. A Review Of Greenworks’ Chainsaws, Are They Any Good? https://www.all-saws.com/wp-content/uploads/2018/06/greenworkschainsaw.jpg 800 1600 Philippe https://www.all-saws.com/wp-content/uploads/2018/09/allsawslogo2.png Philippe2018-06-11 03:12:052018-06-11 03:15:37A Review Of Greenworks' Chainsaws, Are They Any Good? If you are wondering what PVA stands for, a little research will tell you that it stands for polyvinyl acetates. In simple terms, PVA basically means that it is an odorless, colorless material that is used in glues. PVA is used so as to ensure that whatever you are gluing together can last for many decades to come. If you are planning to sell your work, using PVA is a great idea. The reason you should use PVA glue and not any other is … because most of the other glues tend to turn yellow after some time and also break down, as a result, the things fall apart and are no longer glued together. The perfect example of this is the kindergarten craft that you made while in school. After some time, it tends to fall apart this is because the glue used is either school glue or Elmer’s glue. It has no effect on the PH balance of paper or anything else that it may get into contact with. Unless ingested, it is not toxic, therefore you should not eat it. It does not give a bad smell or does it produce harmful fumes. It can be degraded and broken down by algae, lichens, bacteria, and yeast. You cannot apply varnish over PVA but it can be painted over. When frozen, its polymer is degraded and renders the glue useless. It is used for binding of books. Due to its flexibility and strong bond, it enables books to be securely bound. It also ensures that the PH level of the paper is not compromised. It is used for making crafts. This is a glue that is yellow in color and is used for joining pieces of wood together. It is used in wood as it’s able to absorb into it. For best results, you can clump the wood as it dries. This glue is used in the binding of books, paints and sealing of boxes. It is white in color and once its dry, it turns clear. The best thing about this glue is its flexibility even after it dries. With this glue, you are assured that it will not break even after long periods of time. This is a type of glue that is able to counter the effects of moisture and mildew. Its resistance to water means that it can put up with extreme weather conditions. Do not submerge it in water as it will not be able to work well. The best selections for this glue are Titebond two and three. 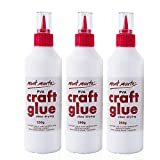 PVA is considered as one of the cheapest ways of joining wood to itself .The glue that is used for joining wood is a stronger version of the regular PVA. It is perfect for very heavy jobs. Once it dries, it is clear but there pre-colored versions that are available in the market and have minimal visibility on surfaces of wood. 1. Take both bits of wood that you want to join together and squeeze the glue over them. 3. You can either use a brush or a specialist spreader to spread a coat of glue over both pieces of wood that you would like to join. 4. To ensure that trapped air is removed, rub the two pieces together from one side to the other and ensure that the glue is evenly spread. 5. Use a G-clamp to secure the pieces together. 6. The clamp should be left on for 24 hours 7. Use sandpaper to sand off the dried excess glue. If you mistakenly get PVA on your clothes or carpet, you can use warm water to remove it. To get it off wood, you will require sandpaper to sand it off. Glue can be used to do a lot more than just doing the ordinary sticking purpose. It has been known to be used for cosmetic purposes and for medical reasons. Below are eight uses of the PVA non -toxic craft glue. This can be achieved by smearing PVA glue layer over the entrance of the splinter. Once it dries, it will cause pressure over the entry hole. Consequently, the splinter is going to be pulled into the glue. The splinter will then join the glue and once you peel it off, the splinter will also come off. When plants are pruned, they can be left predisposed to microorganism infections and bacteria that can result to the destruction of the plant. When you leave an opening on a pruned plant, ensure that you apply a coat of PVA glue. This will create an impermeable barrier for the plant and protect it against bacteria. Frayed shoelaces look pretty untidy and also wear out the entire lace. If you have frayed shoelaces, all you have to do is to curl them with your hands, dip them in PVA glue and leave them to dry for a while. PVA glue can be used in place of filler to fill the cracks and holes in your walls so as to enable painting to take place. All you have to do is to use a pipette for the purpose of filling the holes with glue. For nail polish removal, all you have to do is mix two parts nail polish with one part PVA glue. Paint a layer of the mixture on each nail and leave it to dry. Once it is dry, peel it off with one single stroke. Having trouble fitting screws into the hole? All you have to do is to pour a few drops of glue in the hole. After that, leave it in for about twenty minutes and wait for the results. Once the glue sets, you can go ahead and screw the screws into the whole. They will fit effortlessly. To create special effects such as crackles on walls, all you have to do is apply a coat of paint over the wall and give it some time to dry. Once it’s dry, apply PVA glue over it then wait so that it can become gummy. Once it’s gummy, apply another paint layer then wait for the cracking effect to start appearing. For best results, use a base that contrasts with the topcoat color. PVA glue mixed with liquid starch and food color will produce a cheap supply of slime that you and your children can enjoy for a long while. Below are recipes for making your own glue from the comfort of your home. One of the easiest ways to make glue is by mixing flour and water. You can also make milk glue or a paste out of cornstarch. Milk glue is stronger than flour glue and you will be able to hear the chemical reaction taking place as you prepare the glue. All these are easy to make non-toxic and are a fun project to do with children. • Whip the mixture until it smoothens out. • Transfer the mixture to a saucepan over medium heat. • Set it aside so that it can cool before using it. This is one of the simplest recipes that can be used for children’s crafts. • Add cold water to half a cup of flour until you achieve a consistency that looks like heavy cream. • Transfer it to a saucepan for five minutes and stir it consistently. • Allow it to cool before using it. • It can be used on permeable materials. • An air-conditioned room is the best place for setting PVA glue. • The most water resistant PVA glue is the yellow one as most of them are not water resistant. • White PVA lasts longer than yellow PVA. • To save money, ensure that you are a smart shopper. Avoid overpaying for PVA. Most PVA is more or less the same and can be interchanged with each other. Therefore what can be used on your scrapbook, can in most cases be used on wood. Glue is definitely among those things that will most probably never go out of style unless something else is created that can replace it. It is definitely here to stay at least for the conceivable future because its benefits are simply amazing. With each and everything that human beings create, there will always be an evolution into a flexible and stronger solution that will come up. One of these is the way in which super glue has evolved into different niches. It is not only used for fixing broken china but it is also used in the patching of wounds. The glue is able to bond and seal wounds effectively doing away with the need for stitches. The best thing about it is that it incorporates a healing ingredient that allows faster healing of wounds. For burns and scrapes, spray-on glue can be used on the skin to provide a barrier that protects the skin from infections. It is quite impossible to fathom a world that does not have glue. It has basically assisted in the shaping, molding and bonding the homes that we all live in. The items that we use on a daily basis, without the help of glue it would be almost impossible to have them and in turn, people will live very basic lives. In many ways, Glue those things that simplify our lives and enables us to create, build and repair. The best thing about it is that it is readily available and cheap to purchase. Knowing more about the best adhesives will make sure that you select the best that suits that task. From the above information, you can now get a clear picture that encompasses what PVA glue really is, how it can be used and the areas in which you can use it. With all that you can be able to make a decision on the exact glue to purchase for your next project. By putting all the tips above into consideration before making a purchase, you will be able to save money and but the right product for your project and by so doing, you will create something that will last for many years to come.